CEO Marissa Mayer introduced a new Yahoo homepage today – first on Yahoo’s official blog, and then, moment’s later on NBC’s Today Show.This was huge exposure for Yahoo, Mayer, and Yahoo’s new homepage. The Today Show has a huge audience – about 4.7 million people watched it last week. 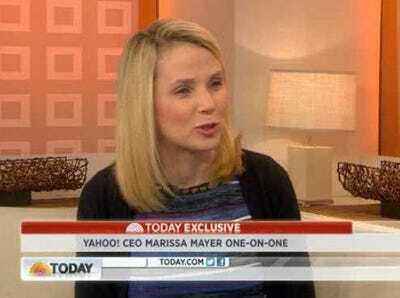 Yahoo has a partnership with ABC News and its morning show program, Good Morning America. One source familiar with the inner-workings of that deal emailed us, shocked that Mayer would go on air with a rival to Yahoo’s partner. Here’s another odd aspect: GMA is even more popular than Today Show. 5.3 million people watched it last week. We reached out to Yahoo PR about the decision to go with Today Show instead of GMA, but we haven’t heard back. Even if you haven’t heard of Marissa Mayer, you know her work. At Google, she helped revolutionise the web and the way we use it every day. Well, now Mayer’s hoping to do the same at Yahoo! as its chief executive, starting with the new initiative she is unveiling here on Today. Marissa, good morning. Great to see you. Let’s– I wanna see what this new design is of the home page in a moment, but let’s start talkin’ about the company. You came on back in the summer with a big job, high expectations. And really, the mission was to turn around Yahoo!. What is the strategy in a nutshell? Well, I think that we’re really focused on the world’s daily habits and making them more inspiring and entertaining. And so that means taking the things that Yahoo!’s always been great at, the home page, search, mail, news, finance, sports. There’s so many great franchises. Really all (UNINTEL) to refresh and more modern, and also capitalising on the trend towards mobile. It’s difficult because this is a highly competitive environment, I don’t have to tell you. And if you read the trade press about Yahoo!, you inevitably run across words like, “Struggling,” “Beleaguered,” or “Silicon Valley’s favourite wounded dove,” was one I read yesterday. What’s been the biggest challenge for you so far? I really think of it in terms of opportunities. I just think that I’ve had a ton of fun coming into the company. There’s a lot of great people there, there’s great ideas. And our users have been incredibly loyal. We’ve had some 700 million users a month on the website, 200 million users on mobile each month. And really delivering to them terrific experiences is something that we’re really focused on. –for every employee. Is it hard though to compete for talent when you’re going up against the biggies like a Google or a Facebook or an Apple? Well, I think what really inspires people is the ability to make an impact. And there’s an– great opportunity to impact a lot of users, impact– Yahoo! as a company for the positive. And that’s something that’s really inspired a lot of terrific company to sign on. You are– the youngest C.E.O. of a Fortune 500 company in America. Is that a help, is it a hindrance, do you find it to be totally irrelevant to what you’re trying to do every day? I don’t spend a lotta time thinking about it. I spend a lotta t– more time thinking about our users and what we need to do in order to really delight them. Well, a lot of people, of course, know that you took on this big job of being C.E.O. of Yahoo! but you had another big job, which is of course having– a little baby who just was born in September. How’s he doing? He’s great. Four and a half months old. And, you know– you took a short maternity leave, just a couple of weeks. Was that hard to pull off in retrospect, to juggle all those things? Most people don’t have to run a company at the same time. Well, I’ve been a mum now for about four and a half months and I’ve been C.E.O. for seven months. And I would say that I wouldn’t have missed a minute of either experience. They’ve both been great. Does take a lot of focus. You need to make sure that you’re really prioritizing that. There’s not a room– lot of room for anything else. But, you know, overall I’ve been having a terrific time with both being a mother and being a C.E.O. Have you been surprised the degree to which this high-profile gig comes with attention everything you do? I mean, people look at– at you as a role model as well, are looking at you as an example. Has that been difficult to deal with? Again, I haven’t just spent a lot of time looking at it or even thinking about it. I’ve really been focused on the products, what we need to do. And there’s so many great people at Yahoo! and there’s many great users that we wanna serve well that I really put my energy there. OK. We are going to demonstrate this new product, but– we’re gonna first take a break. I believe you’re gonna have your big announcement, we’re gonna do a little show and tell right after this. Back at 7:44, and as promised, Yahoo! C.E.O. Marissa Mayer revealing the big change that’s come to its website this morning. All right, we’re gonna do a little show and tell. Yeah, it looks different but not so different that I don’t recognise it. Well, one, we have these nice, big, bold images here, the ability to actually quickly go through all kinds of different editorial content up here on the top. But then we also have, one of the things I really like, which is this very personalised news feed down below. It’s infinite, so you can just keep scrolling forever. It goes on forever and– basically, yeah, all right. And it’s personalised to you. So, for example, obviously I like Yahoo!, so do a lot of my friends. So you can see here, this is an article about the fact that we just had this launch this morning, and some of my f– and you can actually see– that my friends like Yahoo!. So what you’ve clicked on will go to the top of your newsfeed in a sense? Well, what you clicked on, what your friends liked, what your friends have read are all things that would appear in here. And you can actually switch to, say, “See Local News,” “Entertainment News.” And then you can also see over here on the right-hand side all kinds of the information people come to Yahoo! every day for, weather, clothes– sports (UNINTEL). These are some of these utilities. It– it sounds to me the big innovation is it’s more personalised? That’s right. It’s more personalised and it’s more dynamic. People said, “Give me a reason to come back to Yahoo! a few times a day.” And now the content’s always updating and refreshing, that gives you all the information you want. And a few things that are nicer and a bit of a surprise. OK, great. Well, people can get– get on it right now, if you go to Yahoo.com, it’s rolling out this morning?